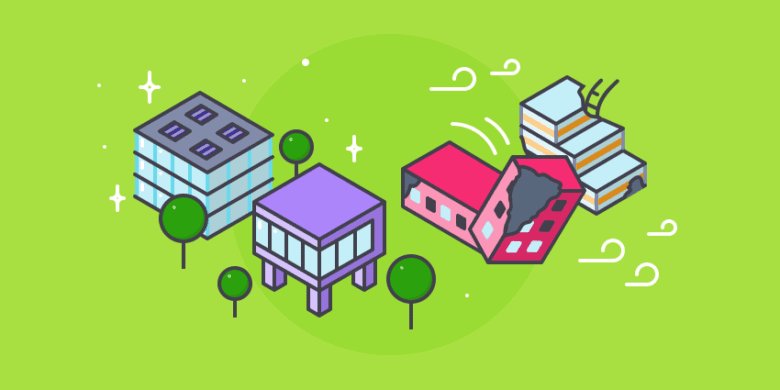 When it comes to project management software, you have a lot of options. There are advanced online solutions, like Asana. There are simpler methods, like Trello. But when you’re looking for powerful, self-hosted project management—especially for software development—JIRA is hard to beat. Atlassian’s well-known project management tool contains a host of features that make managing projects a breeze. And while it was originally created for developers, it’s grown into a fantastic company-wide organization tool that prioritizes productivity and progress. If you’re new to JIRA, or just want to see what it’s capable of, it can be intimidating. This JIRA for beginners guide will show you what this phenomenal project management software can do, how to get started, and how to use JIRA effectively. JIRA is a centralized, highly customizable project management system. All projects are logged into a central database and each one goes through a number of workflows (processes). Workflows control the status of the project as well as the rules by which it transitions to other statuses. Atlassian took these principles and created a project management system around them. User flexibility and customization are key components of the system. With its ancestry in development, JIRA is ideal for software developers. But any department can use its project management capabilities effectively. It’s great for any team that needs to collaborate and work through issues in an orderly manner. Marketing. The company needs a new campaign created. JIRA can be used to communicate copy direction to the writer, graphics needs to the designer, and flag the finished project to be approved by the Chief Marketing Officer. Compliance. Trading and banking firms, as well as nearly all small businesses, need accurate workflow tracking. Whether your compliance department is asking for documentation or you’re being audited, JIRA can help. Remote companies and teams. If you have an entirely remote company or often employ freelancers, JIRA’s team organization abilities will come in handy. It provides a central system for employees and freelancers to check on tasks they’ve been assigned. And managers appreciate the detailed reporting tools. Because it’s such a customizable and powerful project management tool, a full overview of JIRA would take hours. But if you understand a few key features, you’ll get a good idea of how JIRA works. The colored blocks represent statuses, and the arrows show transitions. Every workflow has statuses and transitions, and by creating custom ones for your project, you’ll be able to keep track of exactly what stage any given project or task is in. While JIRA comes with some built-in workflows, its real power lies in customizability. You can design your own workflows from scratch or download pre-built ones from the Atlassian Marketplace. There are a ton of useful features beyond tracking packed into workflows, too. You can set up approval conditions for certain tasks, for example. And there are functions that can be automatically triggered when certain transitions take place. Workflows are the core of JIRA, and the huge number of features built in make them extremely powerful tools. By integrating with feature-rich time tracking software, you can track work time to specific JIRA tasks and projects. See progress as it happens with optional screenshots (turn them off completely or capture once, twice or three times per ten minutes), and get accurate timesheets for your whole team. 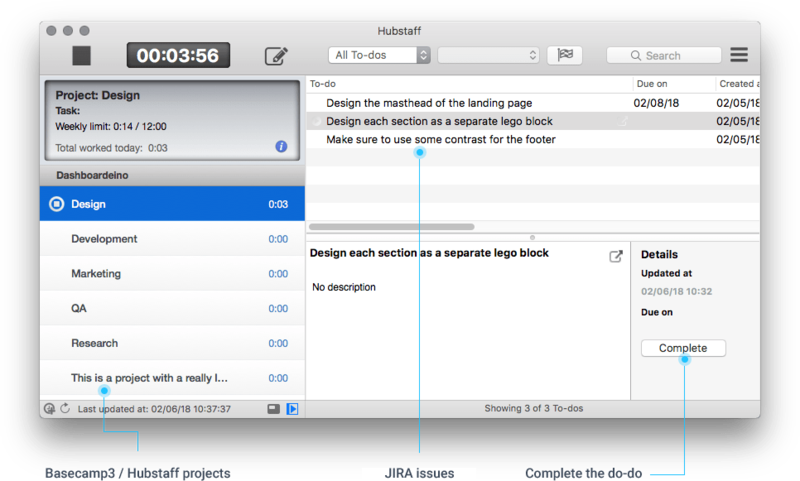 Use time tracking with a Chrome extension, such as Hubstaff, so you can track time to the tasks you’re actively working on in JIRA. When you switch tasks, starting and stopping the timer is as easy as clicking a button.The best time trackers that integrate with JIRA offer mobile and desktop apps for various operating systems, so it’ll work for everyone on your team. Permissions are super flexible and customizable in JIRA. You can give certain team members the ability to edit, comment on, or assign tasks within your team. If you need to change permissions in the middle of a project, that’s easy, too. You can also dictate permissions based on security. Let’s say you don’t want certain team members seeing a specific set of issues within a project. They’ll still be able to view the project as a whole, but these issues will be hidden from their view. This could be useful to keep freelancers or short-term contractors from seeing company-sensitive information without making it harder for them to do their jobs. It can also keep the interface from getting cluttered. 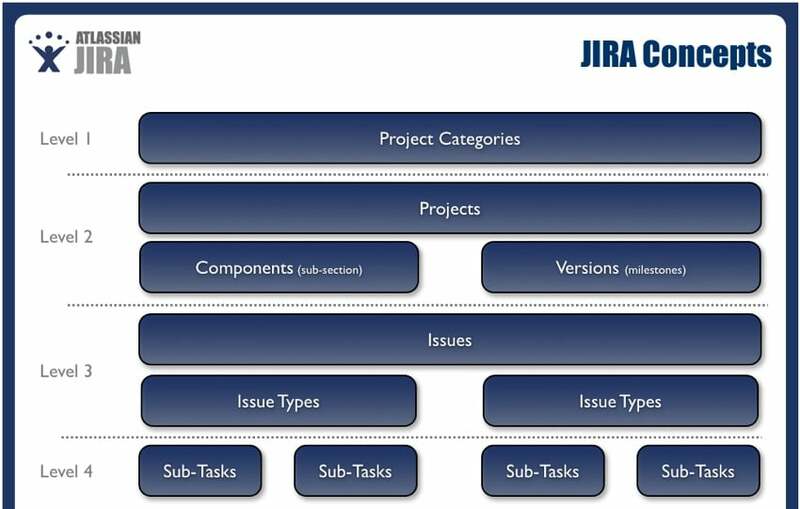 Projects in JIRA fall into four levels, or phases. This helps keep everything organized and easy to find. Level 1 contains project categories. You can think of these as overall themes. Level 2 houses your current projects. It also shows sub-sections of projects and projects milestones. Level 3 is where you’ll find specific issues. You can think of these as your goals within the projects. This is what you need to accomplish to move forward. Level 4 is for subtasks, where you can manage the smaller pieces of complex issues. This method of organization might seem complicated at first, but it becomes very intuitive. And with JIRA’s excellent organizational features, you’ll always be able to find what you’re looking for. Managers can check out project summaries to see recent activity, upcoming issue due dates, and other useful information for getting an overall idea of how the project is going. You can also create reports for open issues, popular issues, or specific team members. All of these reporting features mean you can gain deep insight into your project at any time. Not sure if it’s going to be finished by the deadline? Want to see a specific team member’s workload? You can do these — and tons of other useful things — with just a couple clicks. Complex projects can be easily broken out into “components,” or subsections. These are great for listing issues within a project, assigning team members to new issues that arise mid-project, or coordinating the activities of several groups. Components are also useful for organizing several different parts of a project: a website launch project might require design, development, content, and marketing. All of these can be put into different components to simplify organization and component-specific reporting. Complex issues are made easier to handle by splitting them into various subtasks. Each subtask is treated as a separate issue. These subtasks can be assigned to different team members, given deadlines, and customized even further by giving them their own workflow. Using subtasks makes it easier to gauge the progress of the project, and helps developers (or anyone else using JIRA for project management) better apportion their time. By creating concrete steps for each issue, the entire project can be broken down into small steps. You can link any two issues in JIRA to create an association. These associations include things like “relates to,” “duplicates,” and “blocks.” These links help team members understand how all of the issues in the project are related. For example, if one issue “blocks” another, they’ll know that the first issue needs to be dealt with first. And, of course, you can create custom links that add useful information to your project. A “causes” link could be useful for detailing information on bugs, for example. 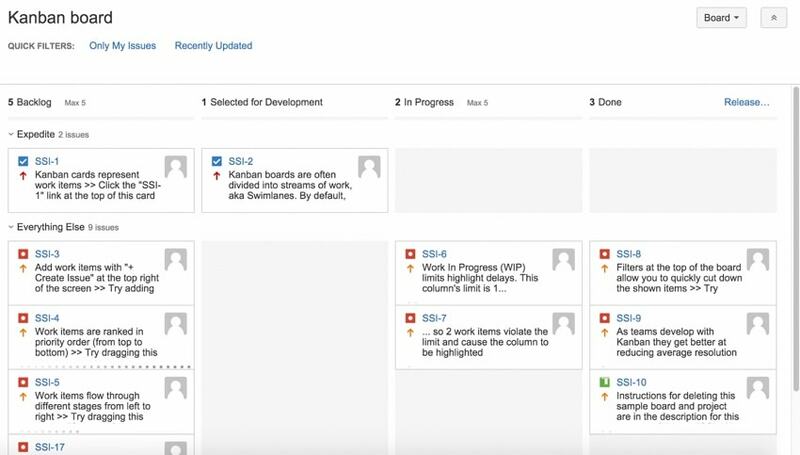 Once you’ve downloaded the JIRA project management software, setting up a new project is pretty easy. It requires a number of steps, but the app is good about helping you through the process. After logging on for the first time, you’ll want to set up a project. A project can be anything from a single item to a massive collection of issues that a team needs to collaborate on. 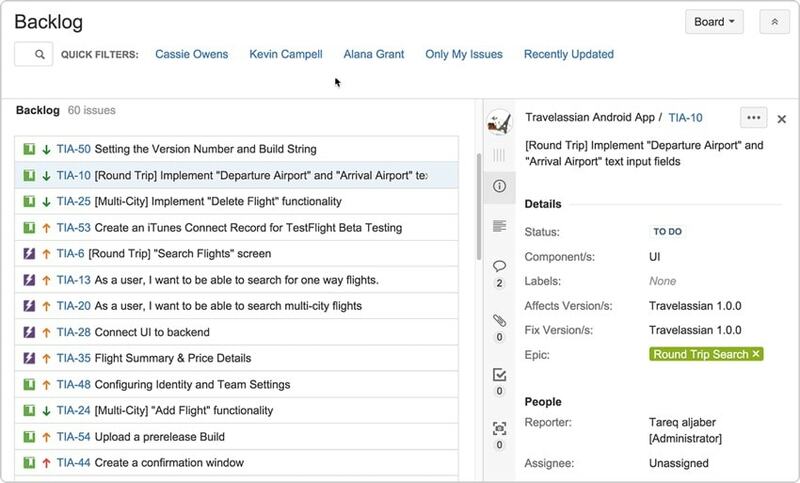 Everything in JIRA is completely customizable depending on a project’s simplicity or complexity. Choose Projects > Create Project from the header. Kanplan is designed to combine the best of the two systems, and enable a backlog with Kanban-style planning. Once you’ve chosen an organizational style, you’ll enter the project details. We recommend choosing a name that includes the team responsible or the project name so you can more easily find it later. Every team member who will be using JIRA needs to be set up as a user. If you have several team members or employ lots of contractors, you can create administrators to handle this task. If you have a smaller team or company, you can do it all yourself. To create your own team, head to Settings (the cog icon) > User Management. Then enter the name and email address of each user. They’ll receive emails inviting them to join. To make a user an admin so they can add other users, select the person and click Add group. Add them to the site-admins group. Now they’ll be able to manage users on your behalf. Permissions are especially useful if you have a large team or regularly employ contractors. But setting up permissions for every project can be a huge time sink. Fortunately, JIRA has a better way: permission schemes. Permission schemes create permissions patterns that can be applied to multiple projects. Once you’ve created a scheme, you can simply add it to a project where you want the same permissions. It saves a huge amount of time in the long run. The next piece of customization is used to measure the amount of work in the backlog (estimation) and the amount of time spent on a sprint (tracking). This will help you manage project deadlines, team workload, and completion. You can use story points or a number of other metrics to measure both estimation and tracking. In the Estimation Statistic field, select Story Points, Business Value, Original Estimate, Issue Count, or <Custom Field>. There are a seemingly infinite number of ways you can customize your JIRA projects. The following are some of the most useful. You can access most of these customization options by heading to the project settings. Creating custom issue types gives you a more detailed picture of your project. You can also use issue types to assign the best people for the job, better estimate time, and prioritize your tasks. Large projects might have many different issue types for better tracking (then again, simplicity is helpful, too). After selecting Issue Types in the project settings menu, you can edit the names, descriptions, and avatars of any of your current issue types. You can also add new types and delete ones that you aren’t using. Customizing your workflows lets you determine how issues will transition between statuses, who has the authority to make those transitions, the conditions under which they happen, and which screens use those workflows. 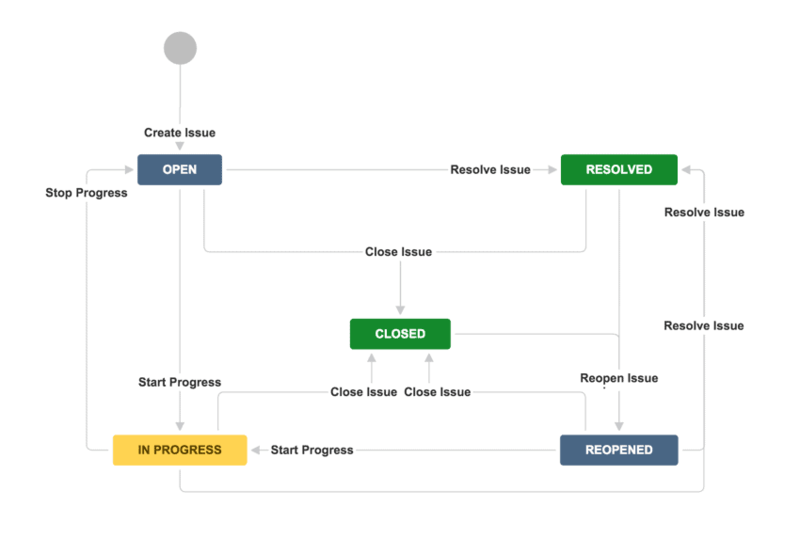 Custom workflows are one of most powerful features of JIRA project management. A very basic example of a troubleshooting workflow might have three states: Open, In Progress, and Resolved. You could assign a specific team to this workflow, and require that status changes receive approval. A screen is a specific collection of fields. In the Screens settings, you can create and edit screens, as well as assign them to specific events. For example, you might want a specific screen to be shown when an issue is created, and a different one when it’s viewed. When it’s transitioned through a workflow step, you may choose another screen. Setting up screens can be time-consuming, but it can save a lot of effort in the long run. When you only see the fields you need at any given time, you can work much faster. In addition to the standard fields, you can also add and edit custom ones in the Custom Fields settings. Nic Brough wrote up a great little guide to best practices for system and custom fields. Be sure to check it out. 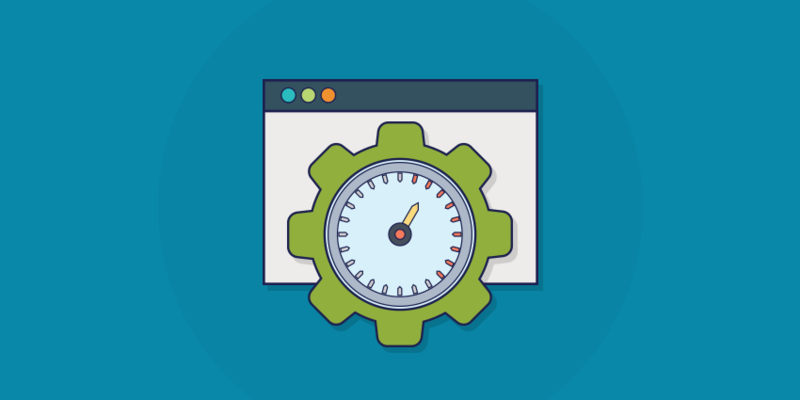 Plugins and integrations can greatly extend the powers of your JIRA project. From time tracking to diagramming and portfolio management, you can get a plug-in for just about everything. You can install plugins directly from the Atlassian Marketplace or by uploading plug-in files. Hubstaff: allows for seamless time tracking, task management, productivity and reporting through desktop, web, and mobile apps. Slack: apps for team communication. Outlook: offers email integration with Jira. Salesforce: automatically exchange data between Jira and your CRM platform. Google Sheets: export issues straight to Sheets for easy tracking. Git Integration: displays Git commits, branches, and tags in JIRA. Zephyr: provides a test management solution. ScriptRunner: a collection of Groovy functions for enhancing and automating workflows (also includes numerous JQL functions). Structure: adds multi-level, cross-project hierarchies. Mail.Ru Calendar: lets you view issues in a calendar format. 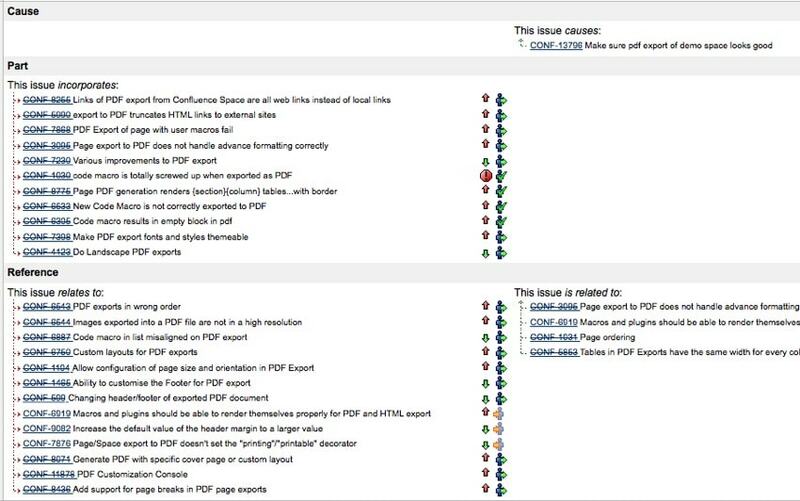 JIRA Workflow Toolbox: adds conditions, validators, and post-functions to workflows. Easybi Reports and Charts for JIRA: creates reports, charts, and dashboard gadgets. At the time of this writing, there are over 1,600 plug-ins that you can use to get more from your JIRA project management. Check out the full list to see what you can do. Small teams: $10 per user per month for up to 10 users. Growing teams: $75 per user per month for up to 15 users. If you have more than 15 users, there is a sliding scale up to 2,000 users. Cloud subscriptions: 1–10 users: $100 for an annual subscription. If you have more than 10 users, there is a sliding scale for up to 2,000 users. For more details on pricing, hop over to JIRA’s pricing page. Because it’s such a powerful piece of software, working with JIRA can be intimidating. Especially if you’re just getting started. But with the overview above, you should have a good idea of how JIRA works and whether it’s a good fit for your organization. Of course, becoming a JIRA project management expert is going to take a long time. But once you’ve reached that stage, you’ll be the ultimate project management master. So start today! Do you use JIRA? What do you like about it? Which features do you find to be the most useful? Share your thoughts in the comments below! This post was originally published May 2017, and updated February 2019.